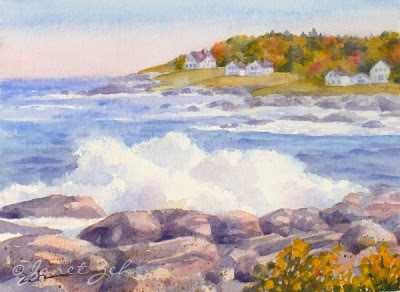 The beautiful and rugged coast of Maine at Perkins Cove is the inspiration for this painting. I've painted this scene several times but this is the first time in the Fall season. I began it as a demonstration of crashing surf for my watercolor students, then added autumn foliage as it is part of my Autumn Collection.